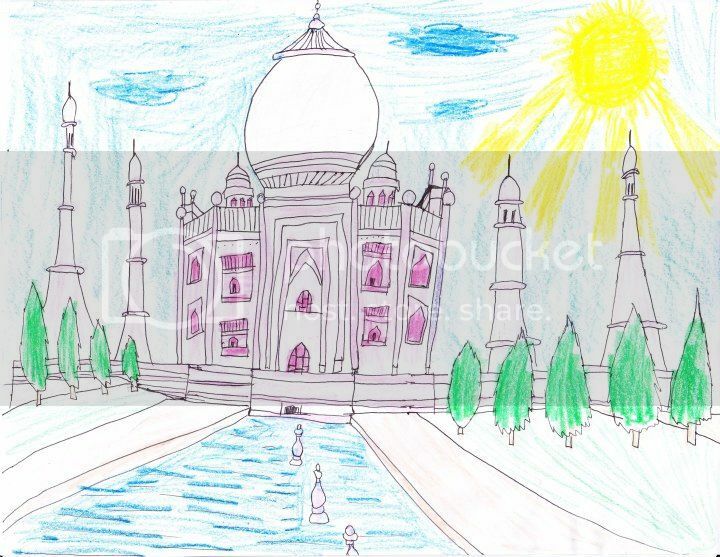 Chloe my 8 year old niece happily showed her Taj Mahal drawing to me. She actually made different versions of this drawing. She had Taj Mahal by night, Taj Mahal at sunset and this one is what she calls Taj Mahal by day. The Taj Mahal is one of the famous landmarks in India. Most lovers visit the Taj Mahal because it’s a place that showed immense love which was the reason behind the construction. It was built in memory of Mughal Emperor Shah Jahan’s third wife Mumtaz Mahal. Because of its great architectural style, the Taj Mahal is one of the universally admired masterpieces in the world. It is in fact regarded as one of the wonders of the world, because the beauty of this monument is beyond words. One of the places that I’d like to visit is India. I’d like to witness its culture, food and people. If ever I can find a cheap airfare to india, I will surely visit the Taj Mahal and be amazed of its beauty. I might invite my niece too so she can witness the real beauty of the monument of love. I’m sure it’s going to be an unforgettable experience for both of us.